Welcome to The Rankel Family on the Web! The Rankel Family has been on Long Island since 1896 when our great-grandparents first emigrated from Gottcher (located in the former Austro-Hungarian Empire) to Richmond Hill in Queens, NY. Their son, Matthew, eventually married Catherine and relocated to Hempstead where they raised four children. Their son, Matthew, our father, married our mother, Patricia and moved to Hicksville, NY. As their family grew in size they relocated to Commack where they quickly outgrew their new house. Moving several blocks around the corner, they finally found a house that could accommodate all six of their children. As they've grown, several of their kids have sought greener pastures in other parts of the country. As of 2007, there are Rankel Family representatives in Commack, NY, Huntington, NY, Rockville Centre, NY, Morristown, NJ, and Greenbelt, MD. As the family has aged it has also grown in size. 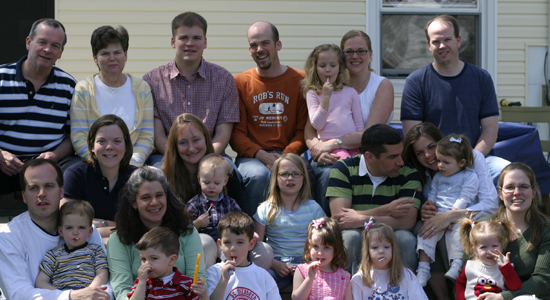 What started as a big family of eight has swelled to an overwhelming 31 people. While some of this growth is atributable to acquistions, the majority has been due to in-house production. You can see all of the grandchildren listed on the left of the page. As of this writing there are no pending additions to the family.